The picture book and story of Pīsim Finds Her Miskanow provides groundbreaking historical information about the culture and language of the Rocky Cree people of Northern Manitoba and specifically the territory around present-day South Indian Lake. 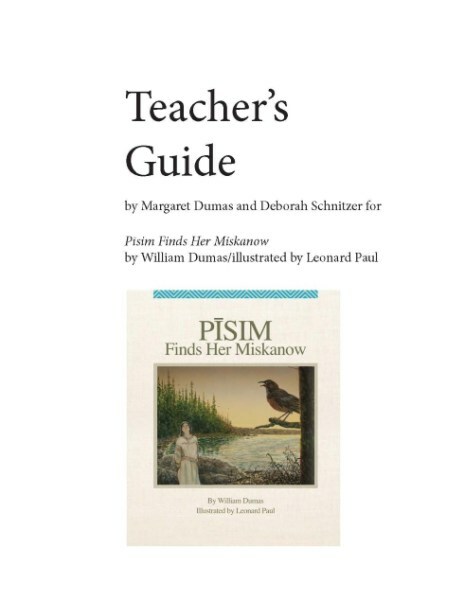 This Teacher’s Guide for Pīsim Finds Her Miskanow came about with the realization that the book needed ideas for teachers wishing to use the book as part of various curricula, including social studies, language arts, science, and visual arts. The activities in the Teacher’s Guide revolve around four main units of study incorporating various themes and activities related to Midwifery, Miskanow, Journey Making, and Storytelling. The exercises and activities suggested in the Guide can be used to support the learning outcomes included in Grade 5 People and Stories of Canada to 1867; Kindergarten to Grade 12 Aboriginal Languages and Cultures Manitoba Curriculum Framework of Outcomes; and Integrating Aboriginal Perspectives into Curricula: A Resource for Curriculum Developers, Teachers, and Administrators for Middle Years. The Guide emphasizes a correspondence with the Grade 5 Cluster 1: First Peoples Learning Outcomes, as given in the Grade 5 Foundation for Implementation document, consistent with its emphasis on the origins of First Peoples, their connections to the land, their culture, types of leadership, the value of oral culture, and the forms of interaction before and during early contact with Europeans. Additionally, this Guide can be used for more specific Student Learning Outcomes as given for Grade 5 in the Kindergarten to Grade Visual Arts Manitoba Curriculum Framework of Outcomes, especially in the analysis of Pisim’s iconotextual elements and the student’s analytical and creative response. You can also download the Teachers’ Guide at the HighWater Press website. A PowerPoint presentation on ways to teach Pīsim Finds Her Miskanow as part of the science curriculum, created by Kevin Brownlee and Myra Sitchon for the 2014 Summer Institute on Aboriginal Education in Early and Middle Years Classrooms. If you have any questions or comments about these resources, or would like to contribute to this page, please email: crytc@uwinnipeg.ca.